Students in Mr. Bower’s sixth grade class at Pequea Elementary School will be taking on a Science identity and networking with students from all over the country in MySciLife during their Science units this year. Click here to view the MySciLife website. The first unit of study was weather and the students assumed the role of a weather concept. For example, Lenny Lightning, Helen High Pressure, Rebecca Rain, Lisa Low, etc. Mr Bower’s role was Meteorologist Max. The students had to respond to prompts and post from their concepts point-of-view. 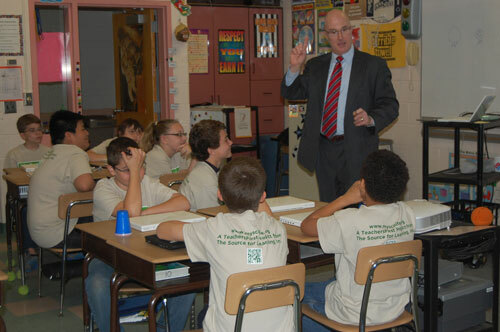 Joe Calhoun, chief meteorologist for WGAL-TV, visited the students recently to speak with them about the science of weather forecasting. The students also got a behind-the-scenes look at how the WGAL Storm Team forecasts weather in the studio and how they use technology to broadcast the weather.